Get ready! They’re here! Disney Infinity toys, somewhat similar to the Skylanders brand, pairs the excitement of video games with popular Disney and Pixar action figures to create a whole new virtual world. Disney Infinity features two modes of game play, play set mode and toy box mode. Play set mode involves placing one or two characters (from the same play set) on the base and watching as they’re magically transported into the video game itself. Each game in this mode is based on the actual movie it represents. Playing in this mode unlocks a wide variety of objects and vehicles that are meant for use in the toy box mode. 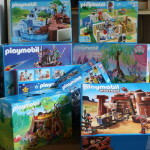 The toy box is the mode that seems to be getting the most praise from kids and parents of all ages. This mode allows players to essentially build their OWN world and make their own game using EVERYTHING they’ve unlocked in all of the play sets they’ve purchased, on a mix-and-match basis. In addition, there are other cool features that make the toy box so popular. For example, there are numerous “mini adventures” in this mode that teach players how to use various tools to build even bigger and better worlds. Players can also win spins, by leveling up characters, to unlock new items and participate in a multi-player mode. A portable toy box for the iPad and a PC version of the game is slated to be released in the coming weeks. Both of these will work by way of special web codes, which are included with each character. Power discs are a separate purchase that add elements to the game, by altering things like the terrain, character stats and available vehicles. Currently, there are 20 different discs that are sold in “blind bags” of two. They are NOT required to play either mode. Power discs are currently making a killing on eBay. Disney invested more than 100 million dollars to create the Infinity toys product line. For the most part, these toys are getting RAVE reviews even though the media buzz has just begun. With Christmas just a few months away, parents are advised to purchase these toys now to avoid disappointment later. Remember, it’s never too early to embark on your holiday shopping!